The 1916 order of Saint George Egg is made of Silver, gold, translucent orange, opalescent white, opaque rose, pale green white and black enamel, rock crystal and watercolor on ivory. The Egg is engraved and enameled with a trellis of green leaf-tips and with small St. George crosses under a shell of translucent oyster enamel. It is draped with the ribbon of the Imperial Order of St. George enameled black and translucent orange, one side with the white and red enamel Badge of the Imperial Order of St. George suspended from a ribbon bow of the Order, and opening by means of a small button to reveal a portrait miniature of Tsar Nicholas II. 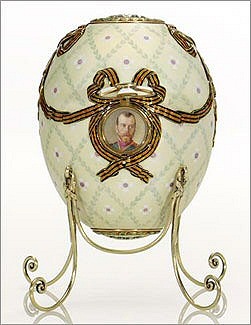 The other side of the Egg with a silver St. George medal with the profile of Nicholas II, the border inscribed in Cyrillic, “His Majesty Nicholas II, Autocrat of all Russia” suspended from a similar ribbon bow and opening by means of a small button to reveal a portrait miniature of the Tsarevich Alexei Nikolaievich, the reverse of the medal inscribed in Cyrillic, “For Bravery, 4th Class,”. 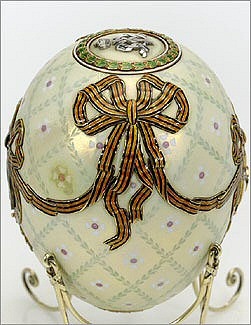 The top of the egg is applied with the silver Imperial cipher of the Dowager Empress Maria Feodorovna encircled by a wreath of berried leafage enameled translucent green and red between edges of white enamel. The bottom of the Egg is applied with the silver date "1916" within a similar wreath, on the bottom of the edge of the St. George medal "Fabergé" is engraved in Cyrillic. 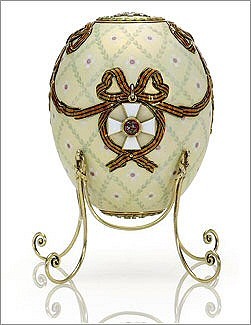 History learns that this was the last Easter Egg that the Dowager Empress received. The 1917 Birch Egg never reached her. 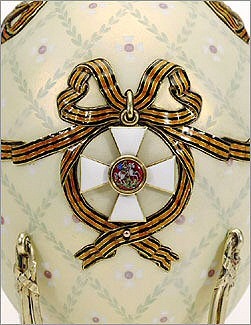 The Order of Saint George Egg is the only Imperial Easter Egg that left Russia together with its original owner! Tsar Nicholas II, in his capacity as Supreme Commander in Chief of the Russian forces, was awarded the Cross of the Imperial Order of St. George (fourth class) on October 25, 1915 upon recommendation of Major General Prince Anatole Bariatinskii. This highest and most desired Imperial military order, created by Empress Catherine the Great on November 26, 1769, had four classes. The first and second, which could only be awarded by the Emperor, had respectively six and eight holders, the third had thirty and the fourth three hundred and seventy-two. The latter was awarded upon recommendation of the army for bravery in battle, or military achievements, distinctions, which, as Nicholas pointed out, did not technically apply to him or his son. The Tsar was proud of this order and took the cross with him to Siberia in 1917. 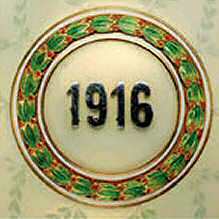 It was found hidden in the bathroom of the Ipatiev House, the Imperial family's last abode at the time of their assassination on the night of July 16-17, 1918. The Tsarevich had been awarded the Medal of St. George (fourth class) to be worn on a ribbon eight days earlier, on October 17, 1915. Hence the inclusion on this Egg of both his and his father's portrait, each surrounded by the order's black and orange ribbon. The Dowager Empress took the Order of St. George Egg with her when she traveled to Kiev in May 1916, thus escaping from the increasingly unpleasant situation at Court and the turmoil of the February and October 1917 Revolutions in St. Petersburg. In March 1917 she was ordered to take up residence in the Crimea by the Provisional Government. There she lived at the palace of Ai Todor but also at Dulber and Kharaks with her two daughters and their families until she was obliged to flee on March 29, 1919 on board the dreadnought HMS Marlborough. In due course, she settled in her house at Hvidore in Denmark, where she died on October 13, 1928. Her collection of jewels was spirited away to England by an emissary of King George V and valued by the jeweler R. G. Hennel & Sons for a total of £100,000. The sale of the jewels, a few of which were acquired by Queen Mary, raised £136,624. Not included in this dispersal, the Order of Saint George Egg was inherited by the Dowager Empress' eldest daughter, Xenia. After her death in 1960 the Egg was sold at auction by her son Vasilii at Sotheby's in London to Tom Lumley acting on behalf of the Fabergé Company. Acquired by A la Vieille Russie and in 1976 sold to the Forbes Magazine Collection, New York. February 2004 sold by the Forbes' family to the Vekselberg Foundation/The Link of Times Foundation, Russia. (The 1916 Steel Military Easter Egg presented to the Empress Alexandra Feodorovna also alludes to the Order of St. George. The (originally oxidized) steel body resting on four shell casings is applied on one side with a gold lozenge-shaped openwork plaque representing St. George slaying the dragon. 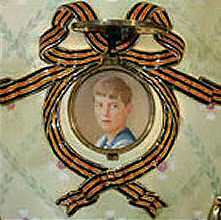 The surprise, a rectangular frame surmounted by a miniature crowned cross of the Order and its entwined orange and black ribbons, contains a miniature of the Tsar and his beloved son in military uniform at the Front).